"I just keep thinking of that C. S. Lewis line, 'Only a real risk can test the reality of a belief'." Did you ever have an idea pop up that you decide to act upon only to later realize it's probably not that great of an idea but you're going to do it anyway? Well that's kinda how I came about reviewing today's film. How did this come about? Well let's start at the beginning. 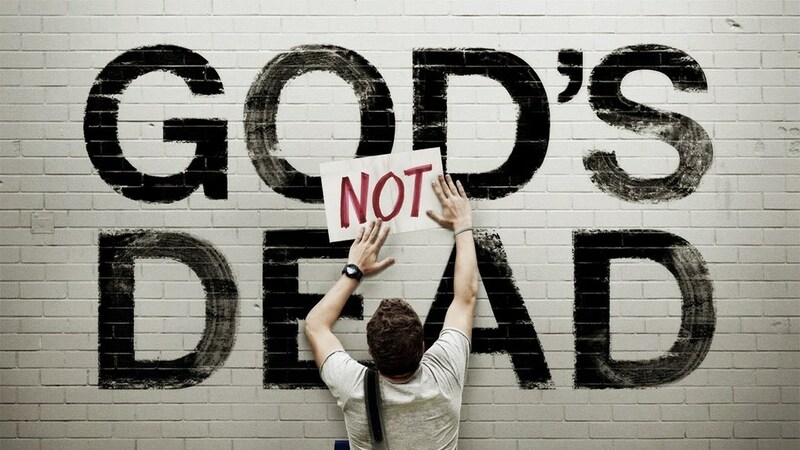 In 2014, the film God's Not Dead was released in theaters. The trailers for the film promised us an intellectual debate between an atheist philosophy professor and a christian student in his class in an attempt to prove the existence of God. To the surprise of many, it became a smash hit grossing in 62 million dollars when the film only took 2 million to make. 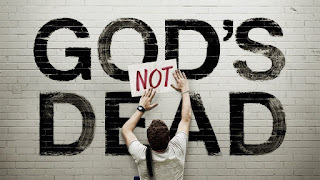 This was so successful that this year they released a sequel to the film (though I think they missed the golden opportunity to call it God's Still Not Dead rather than God's Not Dead 2.) Pastors and Christian groups across the nation were encouraging people to see this film; praising it as a way to share the Christian faith and strengthen your own. At the same time, film critics were absolutely trashing the film left and right due to numerous faults they could see with the film. Eventually, when the film came out on DVD, a local church decided to play it as an outreach and I went to view the film. Ever since watching the film, I've had some desire to cover it on the blog. This is especially true because of the extreme differences in opinion on this film. I am a Christian; I am a believer in Jesus Christ. However, even though I'm purely amateur at it I like to think I do a decent job pointing out the positives and negatives of a movie and as such can judge the quality of a movie fairly well. Most people I have seen review this film are critics who may or may not have the same belief system as the filmmakers, or people such as Pastors who don't regularly offer opinions on film. Since I fit into both categories, I feel as though I should tackle this one. 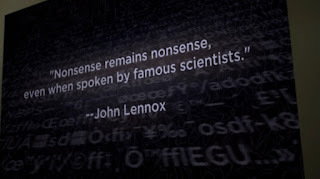 Is it as brilliant as many in the Christian community believe? 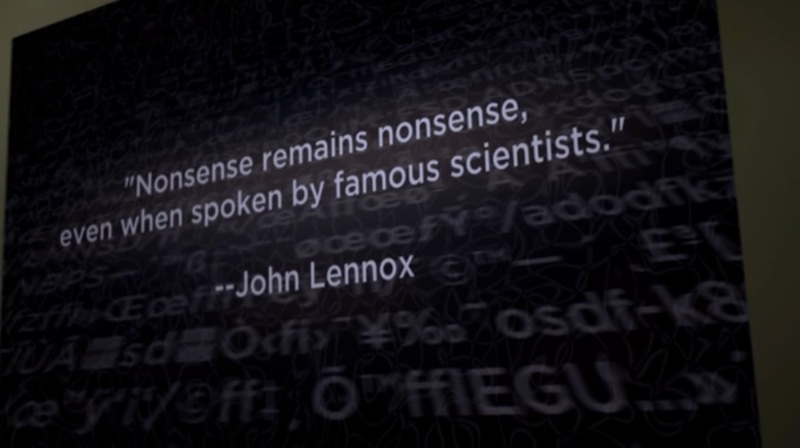 Is it as bad as most professional critics believe? Let's find out. When freshman college student Josh Wheaton (yes feel free to chuckle) registers for classes, his registrar notices his cross necklace and comments that he may want to change his Philosophy class. Josh decides not to heed his warning and attends Professor Jeffrey Radisson's Introduction to Philosophy class. Prof. Radisson is an atheist who doesn't want to use his class time to argue whether or not there is a God. He demands that his class write "God is dead" on a piece of paper and sign it. Josh cannot bring himself to do this as he believes God is real. Radisson informs him that if he does not sign the paper he will be forced to debate the topic of God's existence in the last twenty minutes of the next three classes and if he fails to do so he will fail that portion of the class and lose 30% of his grade. If he signs the paper even in the next class Radisson will ignore the entire thing and move on. Josh seeks the advice of a local pastor and begins his research for his debate. Despite his girlfriend and parent's telling him not to, Josh goes to Philosophy and presents his case. His first topic is the origin of the universe and how the comments about the Big Bang sound very much like what would happen if God said "let there be light." Radisson counters his argument with a comment by Steven Hawking that basically stated that because there is gravity the universe could have created itself. Josh has no counter argument at that time and the session ends. As a result of his decision, Josh's girlfriend breaks up with him; however a student from China, Martin, has become more curious about God because of Josh's standpoint. At this point it's prudent to also mention the other side plots that are intertwining through this story. Radisson's Christian girlfriend has a mother with dementia. Her brother, who has no redeeming qualities, is dating a liberal blogger who has just been diagnosed with cancer; he dumps her because of this. Also the pastor Josh seeks advice for is constantly trying to get to Disney World with a missionary friend but can't because of car trouble. Lastly there is a Muslim girl hiding her faith from her father who overhears Josh and his girlfriend argue. Josh's second session brings about an counter to Radisson's comment about Hawking, stating that it is actual circular reasoning. He then proceeds to point out another scientist's counters to Hawking's theory. However, Radisson has more counters to his arguments. It is at this point when both Josh and Radisson are alone that Radisson reveals he once was a believer but stopped believing in God when his mother passed away. Josh leaves to prepare for his final session. 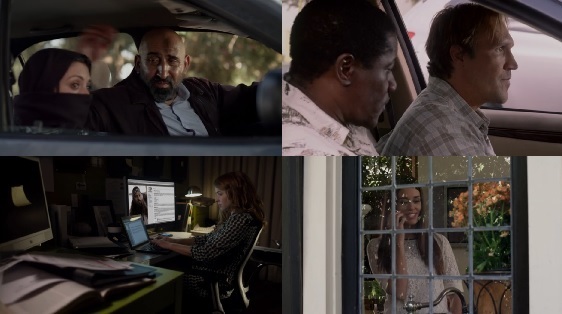 It is during this time that Martin is having conversations with his father in China about God, Radisson's girlfriend breaks up with him, the blogger comes to terms with her illness, and the Muslim girl's father finds out about her faith, beats her slightly, and disowns her. 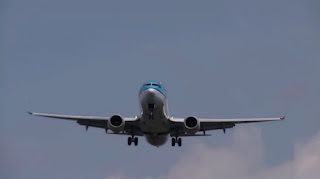 The pastor and missionary still can't get their car running, but because of these delays, the pastor is able to help Radisson's girlfriend and the Muslim girl. It's the final day of Josh's sessions and Radisson has decided to shake things up a bit by making it a full on debate between the two of them. Each begin parrying the others comments. Ultimately, Josh breaks Radisson's composure by asking why he hates God. Eventually Radisson snaps and shouts that he hates God because he took everything from him; that Radisson has nothing but hatred for God. Josh simply asks how Radisson could hate someone that doesn't exist. The students, with Martin in the lead, side with Josh. Josh decides to take Martin with him to the concert for the Christian Artists, Newsboys after the class. Almost everyone in the movie has tickets to see them, and the blogger using her press pass goes to meet with Newsboys. There, they lead her in the salvation prayer before their concert. At this time the pastor and missionary have finally been able to get their car to function but are stuck by the crowds going to the concert. Radisson, having thought over his class that day, reads a note from his late mother and decides to reconcile with his girlfriend. Figuring she was at the Newsboys concert he rushes over. Unfortunately along his say, the professor is fatally struck by a hit-and-run driver. The Pastor is able to get out and lead Radisson in the salvation prayer just before he passes. 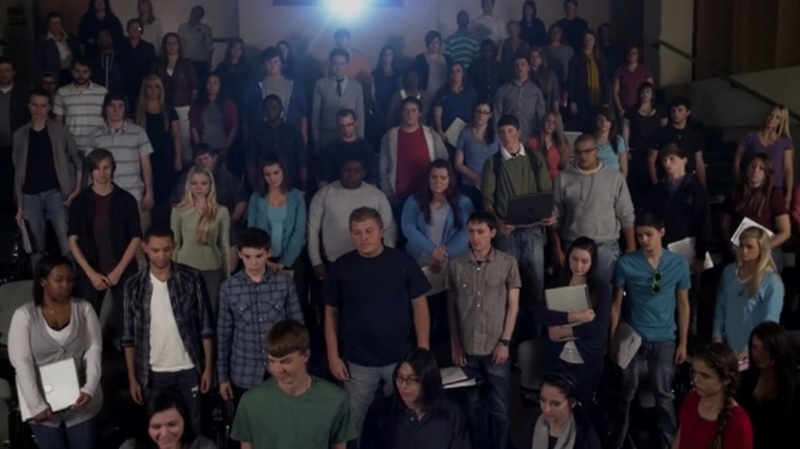 The film ends with the Newsboys' song "God's Not Dead." What's Cinematically Good About It? I enjoyed Kevin Sorbo's performance. 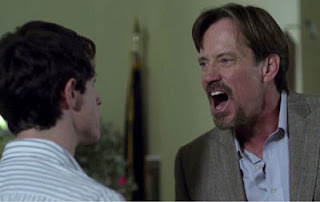 Although I think his character could have been written/created a little bit better (I'll get to that in a later segment), Sorbo did a fantastic job with the type of character he was given. Many of the other actors gave good performances, but the seasoned skills that Sorbo has shown through. You could just tell he was enjoying his time on screen. Even when he was being a horrible person, you were always watching him when he was on screen. 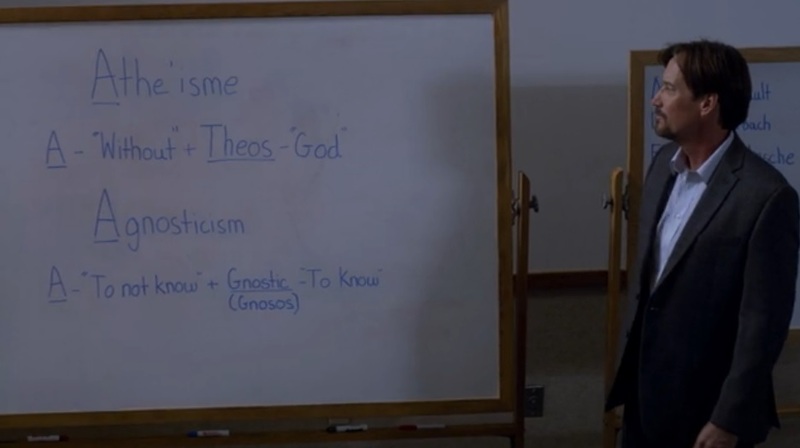 Possibly my favorite moment of his is when another student in the class asks what a theist is. The reaction he produced clearly stated that he just realized his class was full of morons. It was fantastic. He was truly the standout performer in this film. The cinematography of this film was really quite good. Due to budgetary constraints of these types of films, many of them have a very direct-to-video feel to them. Some of them even seem like it was just a student film using whatever equipment they could find. This one was different. With only a 2 million budget, it's not the type of cinematic quality of something like The Force Awakens, or Captain America. That being said it's definitely leagues in the right step for quality. Nothing about the way this film is presented seems cheap. 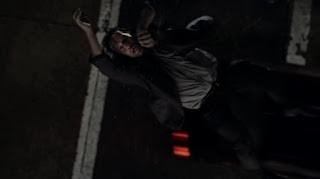 The scene where Radisson is struck by the car could have easily been done off screen but they went the extra mile to show the impact from inside the car and show a shot of Radisson airborne as you can see here. It's a well made product. What's Cinematically Bad About It? The single biggest issue about this film is that it ultimately became an ensemble movie; this was not what we were promised. The trailers and comments about the movie pointed to this big debate between student and teacher. While we did get parts of that, we also got five or six other subplots weaving in and out of the story. Many of these subplots have very little to do with the actual main story. I'm specifically talking about the blogger and the Muslim girl. Their involvement in the main story is that the blogger is the now ex-girlfriend of the brother of the girlfriend of the professor. The Muslim girl just works in the cafeteria and overhears Josh and his girlfriend arguing. That's why I just sort of tossed the subplots in the plot section the way in which I did... they don't really connect to the overall story that this film was trying to tell originally. Trying to tie too many subplots together made the film very unfocused. When you're trying to do something like showcase a debate between an atheist and a Christian on the existence of God you NEED that focus rather than distracting everyone with other stuff going on. The editing has made the ensemble nature of the film even worse. I'm not entirely certain what people were thinking when it came down to editing this film. If you want to do an ensemble piece, that's fine. However, you should know when and where to swap over to other people. 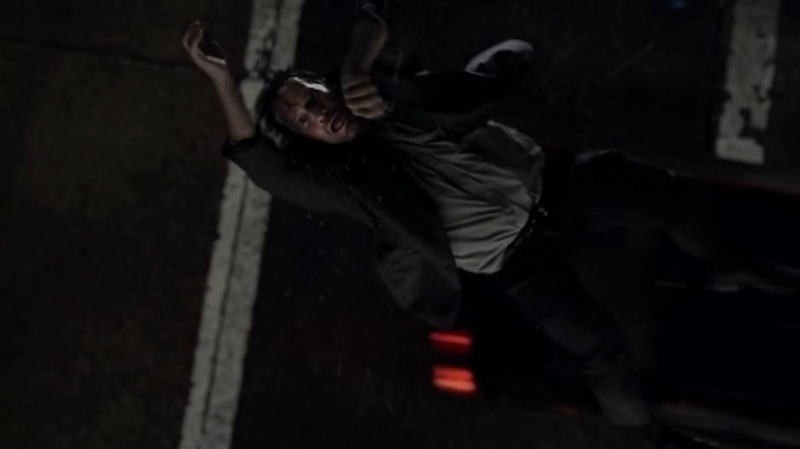 God's Not Dead, however has decided to just randomly toss in other people's actions in the MIDDLE OF A SCENE. I may have mentioned the entire debate as one segment during my plot explanation, but that's not how the film does it. 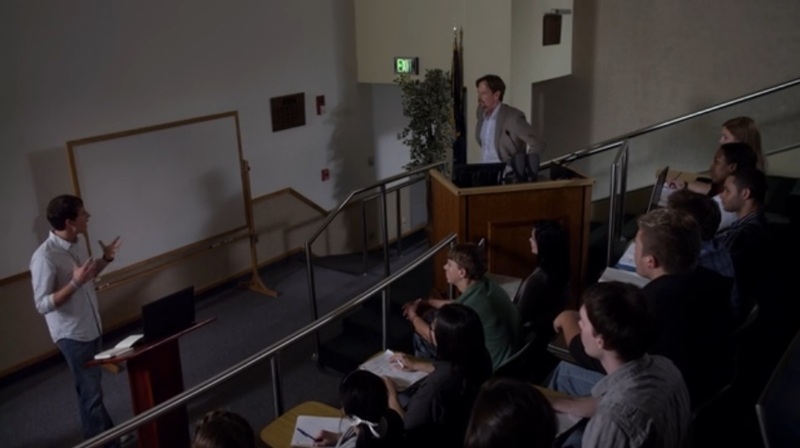 Professor Radisson's first class where he expects the students to write "God is dead" is interrupted by the arrival of the missionary, then it goes right back to the same scene and moment with Radisson as when we left off. Both of Josh's first two debate sessions are paused mid-way through to show what's happening with other characters then it comes right back to the debate. Don't do that! Finish the scene then go to someone else. It only makes the film more unfocused when you slide to something else mid-scene then come back. Is the Christian Message Good? Speaking as a Christian, the message was a good one. Believe in Jesus Christ. Take a stand for Jesus against whatever odds. God is in control of everything and even bad situations have a purpose. You can find comfort in Jesus during your time of need. You must simply believe in Jesus Christ as your savior, accept Him into your heart and believe. God Is Not Dead. All of the messages being presented within this film are wonderful and may even be able to bring non-believers over to Christianity. However, is the message effective? No... not really. When you are trying to get a point or a message across to people you need to have a focus and the cinematic "sins" of this film make it so unfocused that this message, while a good message, can easily be lost on people. How Could the Message be More Effective? I would like to preface this that I am coming to this portion under the realization that this film was a commercial success. It was so successful that they made a sequel and it included characters from this first film. There was no way of knowing during development that there would be a sequel for characters to return in and I can't necessarily fault them on that. That being said, I believe the changes I suggest would have made this a far better film/set of films. The first thing to do, would be to make the non-Christians more rounded and not complete jerks like basically all of them were written as. We have the brother of the girlfriend who has absolutely no redeeming qualities in the film whatsoever. He gets told that his girlfriend has cancer and he breaks up with her on the spot with no concern for her life or health. The Muslim father we barely even get to see that much. All we see of him is his belief that nobody worships God "the way He deserves," then next time we see him he's beating the crap out of his daughter and physically throwing her out of his front door. However, it was Radisson's random anger that really took me by surprise. 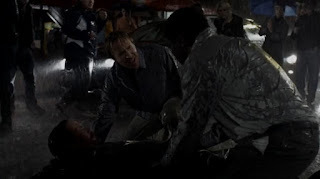 Before the scene pictured here, he was just an atheist who was sure he was right and was amused by Josh's determination. Then this scene happened where he grab hold of Josh, screams about not being ridiculed in his class (which didn't happen) and vows to personally destroy his future career if he continues with his discussions. 1. You would be SO FIRED if this were the real world. 2. You were the one who started this whole thing to begin with. I realize that there are some people out there who may exhibit these qualities but this kind of stuff is not the norm. Just make these characters more relatable and a bit more likeable. Why is this such a big deal? A common criticism by non-believers is that the non-believers in the film are grossly demonized and it put them off; I'd be lying if I said I couldn't see that so some extent. While we're on the topic of Professor Radisson, wouldn't it have been more powerful for Radisson to have lived? Yes, films love a good death scene/sequence and it did show that even someone at the end of their life can accept Jesus. That being said I think it would have been more powerful for Radisson to have found his girlfriend and had the Newsboys lead him in the salvation prayer rather than the blogger. He could then return to his classroom with a new outlook and be a Christian influence in the Philosophy department where atheism is most prominent. As-is, in the world they created, his legacy would be a bitter angry atheist and only God, the preacher, the missionary, and himself would know the truth about his final decision. Lastly, the greatest thing they could have done was focus the film. This could be done by trimming out some of the subplots and making them sequels or included in sequels. This would be the story of Josh and Professor Radisson. The main plotline would be intact as well as the Chinese Student, Martin, and Professor Radisson's girlfriend as these two are the only ones with real ties to the main players in this story. Pastor Dave would be there to help point Josh and Radisson's girlfriend in the right direction and would be a recurring character throughout all of the other films. The film would focus on the debate and keep those segments completely intact without jumping to other scenes in the middle. It would be more of a true debate and at the end Radisson would go to the Newsboys concert, accept Jesus and return to campus. The girlfriend's brother and mother would be removed from the series entirely. This movie's basic theme would be standing up for Jesus and finding redemption through Him. This would be the story of God's Not Dead 2 (which I haven't seen.) This would follow the story of the teacher being put on trial for expressing her belief in God. This movie would have the blogger's side story as she would be following the case thus giving her purpose in the entire story. The main plot of that movie would be intact and would give the blogger something more meaningful and give her more time to grieve over her condition and find peace at the end. Professor Radisson could show up in support of the teacher and Pastor Dave would be there to help out everyone again. This movie's theme would be how to share your belief in a tough situation and finding peace in the midst of turmoil. This would be the story of the Muslim girl given a LOT more thought and effort. It would start from the very beginning of the girl's belief in Jesus and take us on the journey of how she believed in a Muslim home. It would possibly still have her being kicked out but without the domestic abuse. Pastor Dave would show up to assist her through her journey, help get her back on her feet, and provide her with the ways to share Christianity to those of Muslim faith. Perhaps her younger brother would be slightly receptive or her family would still allow her to visit thus allowing her to be a Christian influence in that area. This movie's theme would be choosing to follow Jesus no matter the cost and show how to be an influence despite the religious differences. Maybe I'm wrong, but I honestly feel if the filmmakers would have done a more focused series of films the Christian messages they were trying to bring out would have been must more poignant and effective. 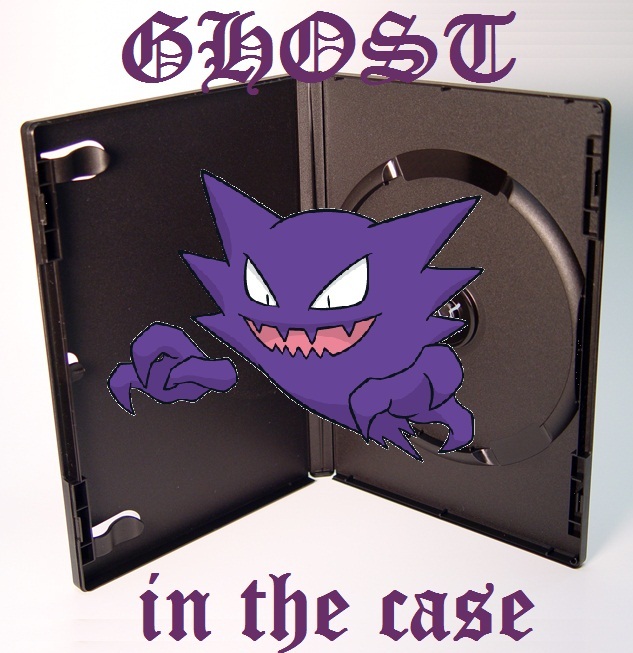 Despite it's best intentions, I found this movie to be really lacking in focus. As I said previously, the trailers and box promise a debate on the existence of God. While we do get that, we end up with an onslaught of subplots that have very little or nothing to do with the overall plot... sometimes interrupting the plot itself. If i were to file this under any sort of category I'd put this in the "not great" category. It's got some enjoyable performances and it's competently shot; I actually enjoyed it more the second time I watched it because I knew what to expect. The editing and meandering of the plot just sort of killed the momentum for me the first time. If you are a believing Christian then you will most likely enjoy this on some level. The acting is pretty good, especially Kevin Sorbo. The messages being told throughout are good and it will reinforce your belief. If you are not a Christian but are interested in Christianity.... you may find something here. I'm not going to massively dump on anything that has the potential to bring someone to Christianity. That being said, I feel as though The Jesus Film might do a better job since this one is lacking in focus. If you are not a Christian and have no intentions of becoming one then... well I couldn't tell you to not watch this film per say. You never know what might be that one thing that nudges someone in the direction of Christianity, but you probably won't find that much here. 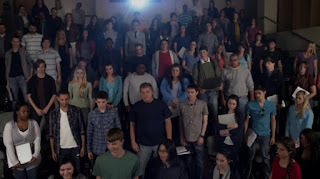 God's Not Dead is rated PG and is available on DVD from Pure Flix. It is also available for streaming on Hulu.